Are you looking for a ZTR that has the features and quality you need for professional landscaping without breaking the bank? 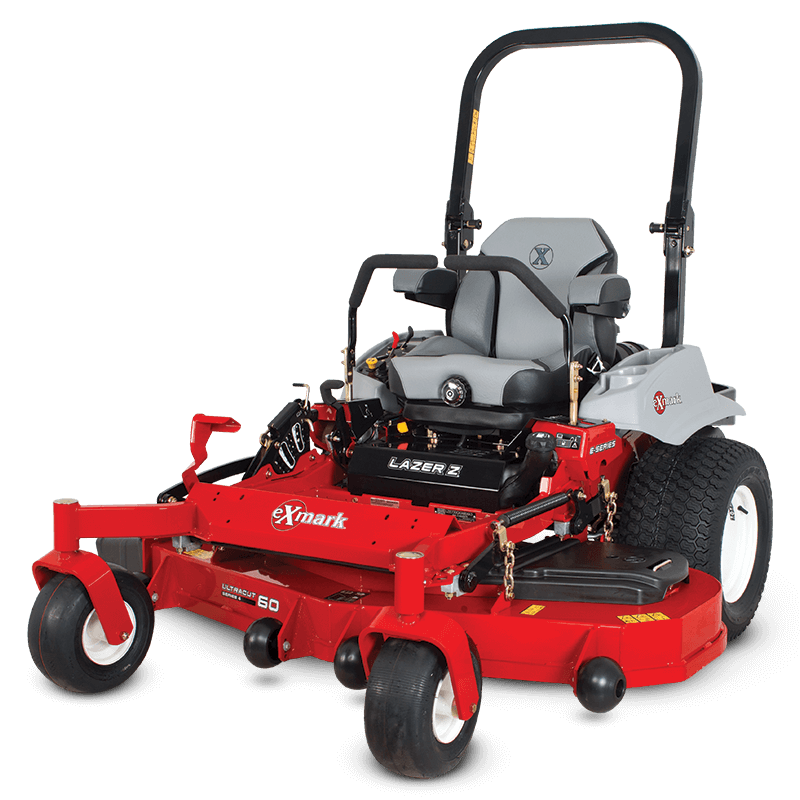 eXmark’s E-Series includes the most basic mowers in their Lazer Z lineup, but they still have high-quality engines, low maintenance components and a high level of operator comfort. eXmark even offers the E-Series with a pair of rear discharge decks, a rarity in this segment. The Kohler Command Pro EFI is available with a 48-inch deck. This was the first EFI small engine on the market, becoming a favorite for buyers looking to reduce operating costs. Thanks to fuel injection, this powerplant recovers from droop faster, uses 25% less fuel than similar carbureted engines, and it’s less sensitive to aging fuel. All other E-Series mowers are powered by a Kawasaki FX. It has all the features you expect from a high-end commercial engine including built-in clean out ports and a multi-stage canister air filter. 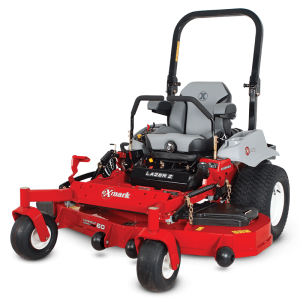 All E-Series mowers are fitted with a fully-floating Ultracut Series 4 Deck. It’s constructed using a 10 gauge steel top plate and reinforced 7 gauge side skirts, and it uses eXmark’s trademark sealed spindles. Splined blade mounts keep the bolts from over-tightening if the blade tip collides with a rock or other obstacle. The deck connects to the engine using a MagStop PTO clutch rated at 175 lb-ft. in Kohler-equipped mowers and 200 lb-ft. in Kawasaki-powered mowers. The E-Series is available with side discharge decks in 48, 52, 60 and 72-inch widths as well as rear discharge decks in 60 and 72-inch widths. Unlike other Lazer Z’s, these mowers don’t get eXmark’s RED control technology, but the same digital display carries over, combining a fuel gauge, battery voltage meter, hour meter and an indicator for the Operator Presence Control safety switch. One thing that does carry over from the rest of the Lazer Z line is a full suspension seat. To fit the arm length and control style of different operators, the lap bars have two height settings, and their dampers have three stiffness settings to get the right amount of sensitivity. Gas is carried in a single 8-gallon tank, making these mowers simple to refuel. There are only four grease points on the entire mower, and these only need to be serviced annually. Belts for the PTO and deck can be replaced without tools. eXmark worked with Parker to develop wheel motors and pumps specifically for these mowers. The pump, motor and fluid reservoir are integrated so there are no hoses. The Kawasaki-powered 46-inch deck model can reach 8 mph going forward and 5 mph in reverse, while all other E-Series mowers have a top speed of 10 mph going forward and 6 mph in reverse. Looking for more comfort? The seat isolation system adds a half inch of free movement in all directions, keeping vibration and bumps from being transferred from the mower to the operator, while the air ride seat adds another layer of vibration control. Extended drive levers provide more room to maneuver, and a ROPS-mounted sun shade helps keep the operator cool. There’s also a 12-volt power adapter that can be used to keep your phone charged. Working early or late? The Hella work lamp kit mounts to ROPS and has a pivot to get the light just where you need it. Need to mulch or collect clippings? The Micro-mulch system adds high lift blades and baffles to slice up and disperse grass clippings back into the soil. For bagging, there’s the Ultravac collection system which holds up to 7 bushels of clippings. Opt for the quick dump version, and the bags can be emptied by moving a release lever that’s within reach of the operator position. A turf striping kit is available for 48, 52 and 60-inch decks. It adjusts for different deck height settings and won’t get in the way when you need to drive over curbs. The foot-operated discharge control allows the deck discharge to be closed when driving around cars and windows. eXmark guarantees the E-series for 5 years with up to 1,250 hours of operation and unlimited hours for the first two years of ownership. Kawasaki and Kohler both guarantee their engines for three years with no hour limit. Shank’s Lawn Equipment is a certified dealer for eXmark, Kohler, and Kawasaki, so we can provide you with the parts and support you need to get the most from your ZTR. Visit our shop at 4900 Molly Pitcher Highway in Chambersburg, PA. To get here from I-81, take Exit 10 to Marion. We also ship parts and accessories across the U.S. and Canada. To order, visit www.shankslawn.com. This entry was posted in Uncategorized and tagged Exmark Lazer, eXmark Zero Turn Mowers, Lazer Z E-Series. Bookmark the permalink.